On the one hand, it doesn't necessarily require a foolish amount of optimism to see Ireland hosting a few World Cup games 12 years from now. On the other, it is just that any talk at all about events envisaged for 2030 seems positively delusional, for the simple reason that we could all be dead by then. Who knows where the world will be, never mind the World Cup. Obviously there has to be some degree of forethought in human affairs both great and small, but drawing up plans for 2030 seems to reek of hubris in the face of all those manifold uncertainties which daily assail our petrified grip on this orphaned ball of rock we call Earth. It gets to a stage where one is almost reluctant to do a week's shopping in advance, for fear of taking things for granted unduly. I mean, there is still a realistic chance that the 2022 World Cup might not end up in Qatar, and not just because the planet may have gone up in flames by then. It is just that, as this outlandish prospect heaves into view over the coming years, a tipping point may be reached whereby the potentates of the global game insist upon calling a halt to this corrupt and dangerous enterprise. On that infamous day in December 2010 when Qatar's name was pulled from the envelope, Russia was also awarded the 2018 edition. England's bid for 2018 had been thoroughly humiliated, winning just two votes from that disreputable junta known formally as the FIFA Executive Committee. England had also lost its bid for the 2006 tournament, Germany coming out on top in that particular carve-up in July 2000. In June the 2026 renewal was awarded to a combined bid from the USA, Mexico and Canada. And so, without apparently even a token nod to the capricious gods of time and circumstance, the grandees are looking now to the contenders for 2030. Even Sepp Blatter has been speculating about the runners and riders. Blatter is 82 but no doubt is already thinking about the seven-star hotel suite that will pamper his ancient arse when he fetches up for the opening ceremony at the age of 94. On this point, and this point only, we must concede to him a grudging measure of respect for his optimism, albeit that consummate gerontocrats such as he are sustained by enormous quantities of self-delusion in the first place. He probably thinks he's going to live forever. Anyhow, the shameless Swiss popinjay turned up in Moscow last June for the Russia World Cup, despite having finally been dumped as FIFA president in 2015 after more than 15 years of brazen trough-tupping. He subsequently said that he felt "abandoned" by FIFA, which may be why he materialised in Moscow, just to annoy the new blazers in charge. Or maybe he was just desperate for one more drink of the old Kool-Aid that came with being the ultimate patriarch of the football family. And it was here that he publicly floated the idea of England hosting the 2030 show - but crucially not just England alone. It would appear that Blatter at the time had been privy to some speculation from inside the cloisters of FIFA headquarters in Zurich. "I think that England, or the islands, they deserve to organise the World Cup," he said on television. "They had it in 1966 so it's a long time ago. I spoke with one of your colleagues and he said if Wales and Scotland joined together and I said, why not Ireland? All of Ireland together. They will be a candidate I'm sure. And I think with 48 teams, you need more than one country, definitely." Three weeks ago UEFA's president, the Slovenian Aleksander Ceferin, added serious ballast to the notion. "I think it would be a very wise idea," he stated in Monaco. "The infrastructure in the UK is very good and in a way if more countries bid there is more chance to win. I think after all these years it's time for that part of Europe to get the World Cup." He attached one significant condition, which if anything would consolidate the Anglo-Irish venture. "The only thing I will insist is that we have only one European bid. I don't want Europe to be divided because of a World Cup bid, and if there was more than one it would be divided as the voting is public. I don't want people to choose between one and another European bidder." The FA in England, seemingly undeterred by those previous traumas, had by then begun a "feasibility study" of the project. Last Wednesday the FAI revealed in a brief statement that it would join the English, Welsh, Scottish and Northern Irish FAs in this preparatory study. In South America, a joint bid combining Uruguay, Argentina and Paraguay is also taking shape. Part of its appeal will be sentimental, and none the worse for it. Uruguay hosted the first World Cup in 1930 and the prospect of a return there for the 100th anniversary would add a layer of much-needed romance to what has become a blatantly corporate extravaganza. Other bids from across the world will presumably emerge in the near future. Minimum stadium capacity for group games at a World Cup is 40,000. Windsor Park in Belfast has maximum of 18,000 which means that Northern Ireland will probably be a non-runner. Croke Park, the Aviva Stadium and Páirc Uí Chaoimh would presumably tick every box. 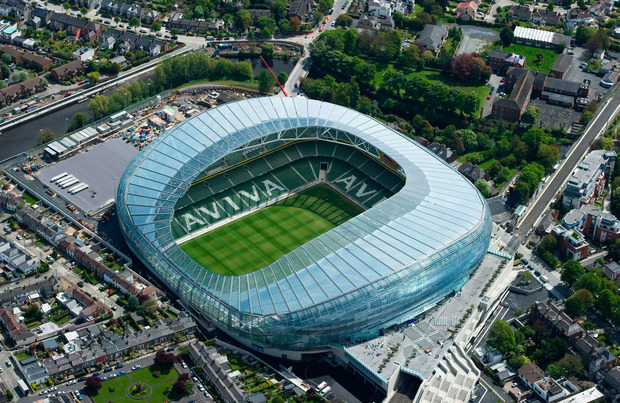 The Euro 2020 finals will be scattered around cities across the continent, including Dublin where the Aviva Stadium will hold four games. The decision for 2030 will be made at FIFA Congress in Doha in 2022, presuming that Qatar has survived until then as the World Cup venue, and presuming that everyone else has survived by that stage too.